Hi Welcome to Free Computer Tricks, today we will know the no network solution of Intex Aqua Young Android smart phone. If you are facing No network problem, Emergency calls only, error while searching for network, unable find network, failed to search network and unable register on network on the Intex Aqua Young smart phone, then this topic will help you to find out the network solution on the phone. In this (Intex Aqua Young) phone you will see two copper points, which connects with signal booster circuit on the back cap. In this tow points one is ground and another is from the internal antenna, when these two point are connected with the external signal booster, the phone receive the GSM or CDMA signal according to SIM card you used. So if the both signal point is grounded on the board itself then you must not get the proper signal. You can check these two point with the multi-meter, if the both points are ground then you just follow the below steps to solve the network problem on the Android smart phone, here we will solve the Intex Aqua Young No Network problem. 1) Remove the components near internal antenna. 2) Then apply jumper from the antenna to the network point. 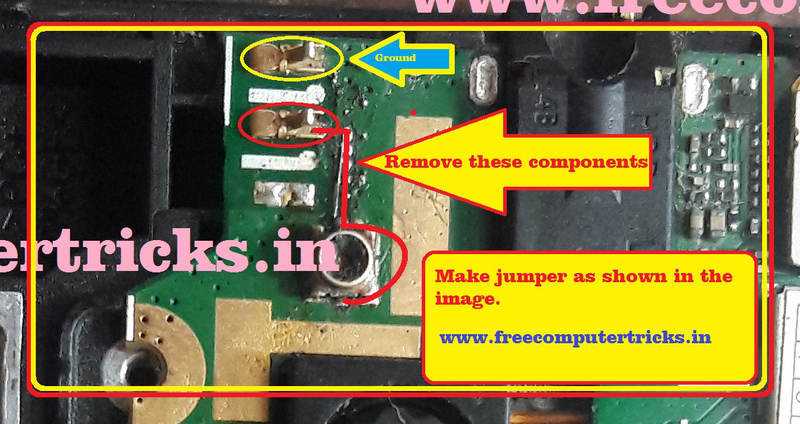 Please see the image above for better understand and apply jumper as shown in the image or you can see the below zoomed image of the network jumper in Intex Android phone. See the above image, remove some components near internal antenna and apply jumper to copper point, which is the way to external signal booster of the phone. Tags: error while searching for network, error while searching for networks Intex, error while searching for networks Android, error while searching for networks Spreadtrum Android phone, no service selected network unavailable, failed network error, failed to register on network, emergency calls only Intex Android Smart Phone, unable to register on network, not registered on network, how to fix not registered on network, no service android fix, no service Intex smart phone.